I've been thinking about this for years. Literally. I've had any number of people ask, "Have you tried using a Fiber Media Converter?" And I always said, "No, but I plan to." Now I can say, "Why yes, I have tried this and it works wonders." I'll assume that most everyone reading this already has a router and an Ethernet Switch so all we're looking at today is adding the fiber bit in between. The Media Converters are powered devices so you'll need to plug them in. All done, plug and play. fyi - I have all of this network stuff plugged into a circuit which is separate from my hi-fi stuff. Electrical noise sources are like opinions, everybody has one (OK, more than one). How many will depend on your setup and how much noise they introduce into your networked audio depends on damn near everything that's connected to your network and even things aren't. All this to say, your mileage may—OK it most likely will—vary when dealing with noise. In my network and in my hi-fi, adding the TP-Link Media Converters and Fiber in between my router and switch improved the sound of my hi-fi. These improvements included an immediately recognizable lower noise floor as evidenced by an increase in perceived loudness, greater clarity across the board, and a larger and more focused sound image. In other words, all good. I could go on talking about specific bits of specific recordings and how they changed but that's all really beside the point since these changes are not recording-specific: They are changes in the presentation of networked my hi-fi system. If you have a networked hi-fi system, I'd recommend trying this out for yourself. I purchased all the above gear from Amazon, so it can be returned for free (we're Premium Members). If you hear what I hear, you'll throw away the boxes, too. To clarify, you are plugging your NAS and server into the router and your endpoints into your switch, which have the fiber in between? How would you rate the magnitude of the change vs upgrading roon server platform, endpoint platform, or USB cables? Just too many variables to say? If I was just starting out, I'd get my storage/server/endpoint sussed out first. I find that cables and accessories do not generally make as large an improvement as components in the audio chain. I am currently building a raspberry pi endpoint. My server is just a standard PC, nothing special other than being quick. I wanted windows so that I could run HQA and add parametric EQ filters. NAS is QNAP 251+. I have read with some interest your results on dedicated endpoint/server boxes and am trying to weigh the relative results of additional expenditures. :) Thanks for the great work on the site. Loving the reviews and the Lovely Recordings articles. Let me know how the pi works out and thank you for your kind words. is the TP-Link plugged into the same circuit as the network, or hi-fi...or a third? All of the network stuff - router, NAS, server, TP-Links, and switch - are plugged into a separate circuit from all of the audio-side gear. 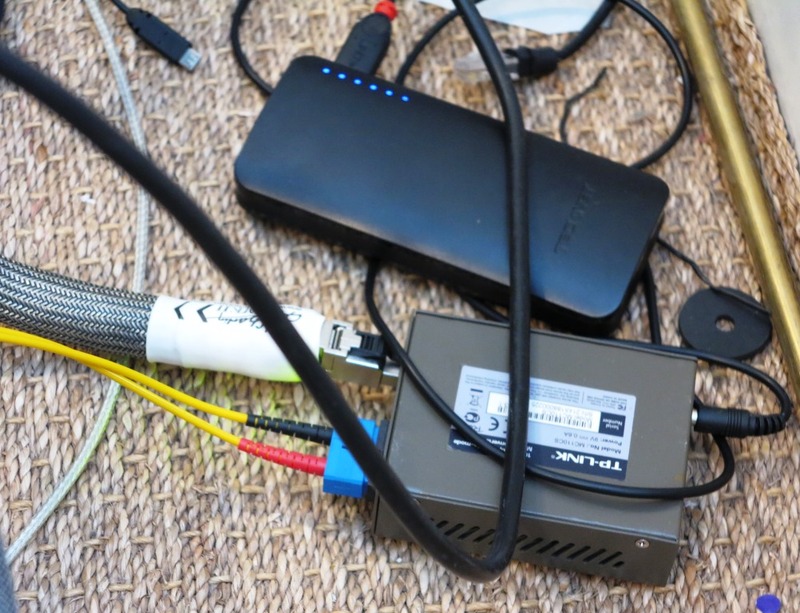 Also the last media converter (before the streamer) should powered by a clean power supply ; LPSU or smartphone power banks are working well there. ...is I need a number of network connections for reviewing. At present, I have 8 devices that need to connect to the network. Can you elaborate on using a power bank to power your source? Have you actually done so in your own system? This is something I've thought about but hadn't heard anyone mention before. this optical isolation setup is heavily used in the audiophile community where I am living. I have powered the last tplink with various kind of devices. I'm looking at getting the Power Zen battery to power my TPLink MC200CM as recommended in the article... BUT the Power Zen has only a 5v output and the TPLink takes 9v input. Are you saying the TPLink will work ok with as little as 5v? I hope so as I REALLY like the charge and use at the same time feature of the Power Zen! Found the sentence "This media convertor can also be powered by 5VDC Adapter." I can agree with the improvement you hear, but I can say, that all these tweaks are endless when having devices without good enough common mode rejection any were in your audio setup, or having purely batterie powered those devices without good common mode rejection or having only devices with good common mode rejection. But sometimes, we need to play with "toys", if we would have the above mentioned ideal case, then we wouldn't have something to play with. My tweaking, at least with this portion of my setup, is about done and I'm enjoying the fruits of my labor as I type. a schematic? I'm getting the Ayre QX-5, so it has a built in streamer and is a Roon end point. I have been going crazy trying to learn as much as possible. Michael has been as helpful as they come and I thank him. I have been talking about having Leon make me a sever or getting the Music Vault as that sounds great, has awesome support and is literally an all in one, but those are both 5k options. I think I should be able to get a Comcast internet account (switching from verse) so I'd get a new modem>router>QNAP 471 set up like Michael showed with Roon Core and possibly Audio Optimizer and one other program I was told about and can't remember>the fiber optic set up in this review. then I'd have a cable run from the room all of the gear is in to the Audio System and just plug in my DAC? If so, I'd only have to spend around 2k total for the modem, router, NAS, Disks and the optical equipment. Not sure how much it would be to have someone come in to run a cable through the attic over a room and drop the ethernet connection for switch into the audio room, but it shouldn't be that difficult (I can't do this anymore due to MS so I have to pay someone). How close am I to understanding this set up? It really doesn't seem too difficult to understand isolation etc... Thanks all. How do you know AC is less noisy? How do you know that the TP-Link's AC adaptor and ethernet output is any less noisy than the switch or router??? Looks to me like unless you have measurements to prove that this makes any difference in the audible frequencies, it could just be a waste of time and money plus another 2 devices plugged into the power bar. ...located on either side of my head. But many switch mode power supplies which I assume these use may add distortions in the high frequency. So how do you know if it might be adding noise say up at 17kHz which might not be audible by an older male but the younger folks might have a problem with??? One way I know is I sat in on a demo of these media converters in a room full of people, some of whom were not older males, yet everyone heard the improvement. about electronics and measurements. I really do. The ears, if working properly, can detect slight differences and it's actually the whole auditory process. I don't know if the differences you hear are better or worse, but I've followed you long enough to have an idea as to what you seem to like. How many times have we heard a system that measure's 'poorly' sound great and visa versa. Granted, certain measurements will tell you things ahead of time, but if you have Amazon Prime, then you can easily return everything, including a sound bar if that's what you are using. Nothing ventured, nothing gained. The more I read forums, the more I wonder why folks who live and die on measurements even bother with those of us who listen first. Is it just to validate their laws and rules about life? This isn't even as costly as a decent pair or interconnects, lol. Phil, thanks. Since my DAC has a built in streamer, I don't even need to use an external one. Dumb question, is the LPS a NAS device? If so, it seems like I can just keep all the gear in a separate room and then run one cable to the audio system and plug the DAC into the ethernet and forget all about USB or AES3, right? In that scenario I assume I'm running a Cat 7 cable from NAS to the other room for the audio and hook that directly into the DAC to bypass the need for a USB or AES3 connection? My ISP modem, router and LAN switch are in a wiring panel in the laundry room. Some distance away, in my home office, the LAN switch feeds an Apple Time Capsule. My Mac Mini server hangs off the Time Capsule. In the living room, the microRendu is connected to an Ethernet drop from the main LAN switch. If I employ the fiber media converter, would I put it between the Time Capsule and the Mac Mini, or is there a better way to configure things? In your scenario, the place to put the media converters would be in between your LAN switch and the microRendu. So Michael, why don't you also use the media converters between your ethernet switcher and your microrendu!!!! ...I simply need more connections to my network because of my job. At present that number is 8 but it varies based on what I have here for review. Sorry to jump in with an unrelated problem. Michael can you please delete my account so that I can join again without my email address being posted as my user name. Thanks. On the subject - Amazon has some PRIME returns, a warehouse deal when you buy 2 and the 1meter cable is cheaper so your mod can be done for $62.40 and it can still be returned if you don't like it. Where would I put the converter with router, NAS, and Mac mini all connected via AirPort Extreme? Do you have a DAC hanging off the Mac mini? ...would be between the AirPort Extreme and Mac mini, assuming you are currently connecting via Ethernet, i.e. not wi-fi. I’m not certain I understand how this works. Is the conversion of the ethernet to fiber optic supposed to eliminate any electrical noise that might ordinarily be present due to the fact that the fiber optic cable will not transmit such noise? In other words, it is not the converter that eliminates the noise; rather, it is the use of a different cable that simply cannot transmit such noise. If that is so, what is generating the noise? Is it the power to the router and switch? And, assuming that is what is causing the noise, I don’t understand how the hook-up described in the article achieves the desired goal. Wouldn’t it make more sense, assuming arguendo that all of the underlying presumptions about noise and how it is transmitted and so forth are correct, to have the endpoint (whatever that is just before your DAC or stereo equipment) be connected by ethernet to the converter then have a fiber optic line to a second converter that is then connected to your switch or router? The connection described in the article has a switch after the fiber optic connection. Isn’t this just adding the noise back into the system? Sitting on the 'network' side of my system are the following devices; the router, NAS (two actually), a USB drive (for backup), and a computer (sonicTransporter). On the 'audio' side, I need to have the ability to connect 8 devices via Ethernet. So yes, after Media Converter 2 there is an 8-port Ethernet switch. As I mentioned in the article, all of these devices, including the switch, are powered from a circuit which is separate from the audio devices. If you are suggesting that this switch, and as someone else suggested the Media convert itself, generate the same amount of noise as the router, 2x NAS, USB drive, and computer, I'd have to say that seems rather far fetched. All that being said, the proof is in the listening. We can speculate near-endlessly about all kinds of things but the point of this article is very straight forward - adding the media converters as described improved the sound of my system. upgrade would be the ifi power supplies on the converters. They are amazingly quiet for what they are. Michael, I'm interested in this product, but I'm not sure my set up applies. My current network audio playback consists of copying my cd's to my computer in flac; sync those files to my phone; using my network attached (wifi) Oppo bdp 103 and the oppo app on my phone I stream the music to the 103; the 103 is connected to the dac in my Peachtree nova 125se. Would the device under review possibly improve the sound? Thanks. ...no need for optical isolation. Yes that does make sense. Thank you. Michaels setup is probably different as he is reviewing stuff and needs more than one ethernet link to his media server(s) but Phil's diagram makes sense. Of course one could be extreme and put another set of these devices between the Modem and the LAN Switch. I read somewhere a while ago that it was a good idea to separate out the ethernet links serving the audio side (Network Attached Storage to Media Server) on a separate LAN switch from computers etc. to avoid cross talk contamination through power supplies but that's probably taking things too far, at least for me. I do however use inexpensive (Chinese) Linear Power Supplies for my switches. If I was normal (joke), I would only need to connect the microRendu to my network in which case the Media Converters would sit in between my switch and the microRendu. "In your scenario, the place to put the media converters would be in between your LAN switch and the microRendu." Which means I can put it in-line between the ethernet jack in the living room and the microRendu, also in the living room, right? The media converters are effectively an ethernet de-crapifier then -- do you agree? I will be very curious to learn what people (esp M. Lavorgna) think of the new PS Audio LANRover, which conceivably will do the job of the media converters and the microRendu. But it probably won't, because nothing is ever that simple in this category. I'll be taking a look and listen to the LANRover in the near future. Where to place the media converters in my crazy audio (and video) system? Western Digital WDMyCloudEX4 16TB, ethernet cable to Linksys router/access point; Linksys with ethernet cable to CAPSv3 ZUMA running the main ROON program; Linksys with ethernet cable to microrendu running as ROON endpoint.CAPSv3 Zuma doubles as multi-channel media server via HDMI to Theta Casablanca IV SSP. Note that my cable modem and main Linksys router are far away in my home office, and I use a Linksys via the home electrical wire over to my dedicated theater room's Linksys router which is configured for use as an access point. This works fine for me!!! Question about where to place the switch? I understand that it doesn't really matter where it goes in the chain - as long as it is after your ISP hookup, it can go before or after the router, or before or after the wireless access point - it just depends what is most convenient in terms of ports? But what makes anyone think that these transmitting/receiving devices would result in any less noisy output?! And isn't the microRendu supposed to be good at rejecting noise and jitter after spending >$600? In your case, how do we know whether the TP-link's ethernet output is any better in terms of jitter or noise than straight from the gigabit switch which could be an electrically "quiet" device? I know a hundred bucks isn't a big deal but this is adding 2 more devices in the chain, 2 more AC adapters. a) The mR is noise reducing; the fiber connection is probably even quieter and adds real isolation from what comes before it. b) lots of people - not just Michael - have reported it works, with much the same description as Michael. Don't know about noise reducing per se, but it is supposed to be good on the noise and jitter departments presumably for the USB port output which is ultimately what's important. b. "Lots of people" have claimed lots of things and abandoned these ideas over time. This one seems dubious and excessive because of all the devices in place and likely lower quality switching power supplies in the chain. The only switching power supply that this "adds to the chain" is the one in the receiver. Re. being dubious, while I can understand skepticism, the only way you'll ever know for sure is to try them. Otherwise, it's just guessing. I kept reading about optical isolation but was confused as to how to implement it. That clears a lot up. With the setup above, you need another 3 electrical outlets in addition to what is needed in your setup right? For the media converters x2 and the switch. These come with switching supplies I presume. They do not need separate linear power supplies and good power cords I hope? Micheal, does this apply to my system? If I understand correctly the fiber converter does not apply to me because I have no ethernet connections in my system. No Ethernet, nothing to isolate in terms of a network connection. It sounds like these converters only output 1000Mbps and aren't compatable with 100Mbps devices. At least that is what some of the amazon reviews have said. Would inserting a switch that is compatible with both speeds allow you to use a streamer that only has a 100Mbps port? I'd just buy a 100Mbps version. I saw a review at Amazon that said that the TP-LINK MC200CM units get hot to the touch. Is that your experience, too? They get warm. Nothing to worry about. Any specific features suggested to look for in a switch? Or just any standard switch from a reputable company? So could you confirm that the TP LINK MC100CM will be as good for audio streamming as the one you have ? Best thread Michael. BEST THREAD in ages. I greatly appreciate all your hard work on this site as you know, but this thread just takes the cake. I'm close with many of the guys on CA now through various contacts and some of the leaders have been working with me to discuss using optical. I'm waiting on my Ayre QX-5/Twenty (finally get to audition it at Audio Connection with Alex from Ayre next Saturday...yes!!) and will be getting rid of Frontier as I HATE THEM. I'm going back to Comcast and need to buy a new modem as well as a new router regardless. You know that I've been all over the board in this search, but since the Ayre is a true digital hub with streamer and 10 connections, I will use it that way. I don't need a server even though I was about to get the Music Vault, lol. So glad that I held off as now I'll get either the Melco to use as a NAS or the QNAP 471 set up the way you showed last week. Either way, I'll use the ethernet connection from either device. Still need to try and figure out which one will sound better with the Ayre. I don't have to have Roon and honestly, some of the guru's I've spoken with aren't totally sold on it either, but I still may. Either set up will be getting the optical treatment for sure. I'll pay someone to run the optical cable, but if folks want to go crazy, there are some different types of CAT cables to use in various places that probably increase the sound quality even more, lol. Just read what Phil showed above and it's easy to figure out. He KNOWS his stuff too folks. I've been told by more than a few that the PSU's you use with the converter etc... DO make a difference. You can get very good ones for $400 if you chose. Lot's of places for those. I would't buy one unless you like the sound difference in the first place and then go one at a time. I'm going to buy mine through Steve Nugent at Empirical Audio as he uses the Paul Hynes regulators and makes as good or better a PSU as Paul himself (although you can't get one from Paul anymore, lol). I have used one in the power station on my former DAC, the Empirical Audio ODSE/SE with upgraded caps etc... and also on my Mac Mini server I use now that used to be Steve's personal DAC with all the high res, well recorded stuff. I'll be selling that off as soon as I get THIS new set up in place. Long post, but everything counts in the system from the 'sound' of it, lol. YEs even the PSU's count even with the isolation I guess. My assumption would be to do the last converter first??? Phil??? Michael??? Thanks to all of you who are sharing such great knowledge and making this tedious task fun! I had this device hanging out from pre Roon/microRendu days. It was on the ethernet line going to my jRiver server. I now have it on the ethernet line leading from the switch to the microRendu and it is a definite improvement in lower noise floor as shown by a louder, fuller/richer sound. I have the optical isolators Michael described on order and will try them and report back how they do against this device. I dislike having to add all of that complexity to my system so I am biased towards the SOTM Isolator being just as good. It is always good to admit your biases - especially to yourself. If you do try the SOTM Isolator make sure you get the directionality correct as it makes a difference. 50/50 chance that optical network isolators will cause connection and playback issues. The use of optical network isolators is not recommend. Seems to be working well here with the MicroRendu. ..but presumably Andrew Gillis had a reason for writing what he wrote and that might have been based on a slightly larger sample. So I thought it would be worth pointing out since you are recommending a configuration known to cause issues roughly half the time to readers, some of whom appear to have very low computer literacy. You may want to loop back with him. I've been looking into this for years and my rough estimate of my sample size, which includes forum posts, numbers in the hundreds. I'll be writing my impressions of this in a future review. Steve, is this an alternative to the Intona isolator or do they both add something when used together? A few people on the Meridian forum have reported good things from using it. I guess it is performing the same function as optical isolation, with the benefit of being passive. I believe it is about 300 Euros though. Artistic fidelity is a company from Acousence. Acousence is a recording company going strong for 24 bit recordings. The network/streaming products are byproducts now sold under an own brand. ..I thought you were somehow associated with the site and replying on Michael's behalf. Should have said "..Michael recommended it.."
Anyway, bowing out of this one, I'm not trying to score points here and I have no horse in this race. Was just trying to be helpful and save Michael some blowback if it turns out to be a problematic combination in other configurations. As I mentioned in the review, all of this stuff can be returned with little or no cost if they don't work out. TPlink works fine in my system, placed between Linksys AC1900WRT GB router and microrendu (I also use CAPSv3 for Roon core, using roon endpoint of microrendu). However, just set up a Transporter i5 and microrendu for a friend, who has Cyberlink GB router and also Netgear GB switch,and TPLink did not work in his system Go FIGURE! ...my setup is not typical as I'm running 7 other devices in addition to the microRendu after the media bridge. I suppose I'm one of the lucky 50? Running since Saturday with no dropout issues. They get warm (112F) but not hot. About the same temperature as my Netgear Switch (114F) and LPSU (101F). Outside in VA the Heat Index is 104F so par for the course in this part of the country. Ok, so here is the part I get. My Mac Mini is plugged into my DAC with a USB cable. I use the internal hard drive of the Mac Mini to store music. NO Ethernet cable in my audio system. THis device does not apply. OK. here is the part I am unsure about. I use a good Ethernet cable (AQ Cinnamon) from my cable modem to my router. From the router, I have a wired connection by Ethernet to my main computer and a wired Ethernet connection to my Apple TV (the wired up Apple TV has better video quality than when used with wifi). THe router also feeds my iPad through wifi. Is there a place I could use this device to improve the feed sent to my Apple TV? ON the Ethernet cable between the cable modem and router? On the Ethernet cable between router and Apple TV? SOrry for the typos. MY iMac is in the shop, and I have to type on my iPAd. I hate typing on the iPad! ...would be between the router and Apple TV. Thanks Michael. It's worth a try. I know this is off topic Michael, but I like the way that you called bullcrap on the people who took a dump on Ayre over on Stereophile. That whole slew of comments pissed me off. People ranting about stuff they imagine in their heads, then attacking others with nothing but their imagined obsessions. I stayed out of it, because I hate trying to discuss rationally with people hell bent on spreading misinformation. My local dealer is highly selective of the brands he sells. He has gotten rid of brands, and refused others for much less than what Ayre has been accused of in that thread. He sells Ayre and supports the brand enthusiastically. He would never accept that one of his customers would get shafted by a manufacturer. The stuff in that thread is BS. I've grown tired of seeing that kind of nonsense go unchecked. I was considering the sOTM iso-cat. Michael, how does that compare to the TP-Link? It is a less costly solution but are there audible differences. Maybe Lifer has already had the chance to compare like he says in his post? Perhaps a week from now I will be ready to say how I feel about it versus the sOTm isolator. So I guess we need them all in a chain to be truly de-crapped. The components to implement optical isolation are arriving piece-meal and so I decided to compare the AQ Forest to the SOtM cable that comes with the isolator. Sorry to say that the SOtM is the superior transmitter. Sorry because I can always get the AQ Forest cheaply. Now I know that when I switch the SOtM Isolator for the optical devices I will keep the SOtM cable in place. I can't try the SOtM versus the AQ Vodka or Diamond cables because the SOtM is only about 8 inches long.